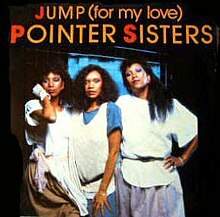 (1984) "Jump (For My Love)"
"Jump (For My Love)" is a song by American vocal group The Pointer Sisters, released by the Planet label on April 11, 1984 as the third single from their tenth studio album Break Out (1983). Remade as "Jump" (with no subtitle) the song would afford Girls Aloud a 2003-04 international hit. "Jump (For My Love)" was co-written by regular collaborators Marti Sharron, Gary Skardina and Stephen Mitchell. Skardina and Mitchell were responsible for the chord progressions and arrangement while Sharron's focus was on the lyrics and melody. According to Sharron the instrumental track for the demo of "Jump" was completed before the lyrics: on first hearing the playback of the instrumental track in the studio (Marti Sharron quote:)"My partners and I...were so happy with the results we jumped up and down" which led to the song being completed to be entitled "Jump". (The subtitle "For My Love" was eventually added to differentiate the song from the Van Halen #1 hit "Jump".) Sharron recalls phoning Richard Perry, who was producing the Pointer Sisters' upcoming album, and telling him: "I have the album's big hit" and - although Perry considered giving the song to Julio Iglesias, Perry being a contributing producer to the singer's 1100 Bel Air Place album - "Jump" did become the final song slated for the Pointer Sister's 1983 album release Break Out. Despite typifying the overall sound of Break Out, "Jump (For My Love)" was passed over as the album's lead single in favor of the ballad "I Need You," which Perry felt would reinforce the Pointer Sisters' presence at R&B radio, and although originally scheduled as the album's second single, "Jump..." was superseded by another Break Out track: "Automatic", which had enjoyed heavy radio and dance club airplay as an album cut. "Automatic" returned the Pointer Sisters to the Pop Top Ten after a three-year absence; however, "Jump..." became the most successful US single off of Break Out upon its release as the album's third single in April 1984. The song ascended to a peak of #3 on both the Hot 100 and R&B chart in Billboard magazine that July, with the track also charting on Billboard's adult contemporary chart at #11. "Jump (For My Love)" would afford the Pointer Sisters an international hit, charting in Belgium (#3 on the Flemish chart), Germany (#20), Ireland (#2), the Netherlands (#9), New Zealand (#3), Switzerland (#13), and the UK (#6). In Australia, "Jump..." was issued as the lead single off Break Out in December 1983 and peaked at #79: reissued after "Automatic," it would reach an Australian chart peak of #8 in September 1984. The Australian single release of "Jump" was also unique in featuring as B-side the Break Out track "Operator" with Anita Pointer on lead; in other territories, "Heart Beat", a track with Ruth Pointer on lead introduced on the Pointer Sisters previous album So Excited!, was utilized as the B-side of "Jump (For My Love)." Released prior to the 1984 Summer Olympics games, the song's video featured footage of athletes competing in track and field events, as well as NBA stars Julius Erving and Magic Johnson. The Pointer Sisters were awarded the 1985 Grammy Award for Best Pop Performance by a Duo or Group with Vocal for "Jump...", and co-writer Stephen (Steve) Mitchell received his nomination for the Grammy Award for Best Pop Instrumental Performance in 1985 for his musical performance as the principal musician on the song's recording. At the 1985 ASCAP Pop Awards, "Jump (For My Love)" received "Most Performed Song" honors for songs in the ASCAP repertory during the 1984 ASCAP Survey Year. "Jump (For My Love)" is published by Sony/ATV Music Publishing, Anidraks Music,Inc. and Stephen Mitchell Music, Inc.
(1997) "One More Time (The Sunshine Song)"
In 1997, house producer Groove Terminator covered "Jump" for his album It's On. Unlike the original, this cover is very electronically backed and very adapted to the style of the 1990s. From the cover exists on the CD single also extended version and a remix. Some are Techno influences mentioned in the cover. from the album Sound of the Underground (re-issue), the Love Actually soundtrack and What Will the Neighbours Say? In 2003, British girl group Girls Aloud covered "Jump" for the soundtrack to the romantic comedy film Love Actually (2003) although ultimately it was not used in the movie; the Pointer Sisters' original was instead. Their version was produced by Brian Higgins and his production team Xenomania, recorded at the request of Love Actually director Richard Curtis. Upon its release in November 2003, "Jump" continued Girls Aloud's string of hits, peaking at number two on the UK Singles Chart and receiving a silver certification from the British Phonographic Industry. Their version appeared on the re-release of their debut album Sound of the Underground and was also included on 2004's What Will the Neighbours Say?. The song was also featured in Just Dance 3 for the Wii, Xbox 360, and PlayStation 3. The music video was intertwined with scenes from Love Actually to make it appear that Girls Aloud snuck into 10 Downing Street to spy on the Prime Minister (Hugh Grant). "Jump" was promoted through various live appearances and has since been performed on all of the group's concert tours. Despite receiving criticism from contemporary music critics, "Jump" has been seen as a turning point in Girls Aloud's career. The director of Love Actually, Richard Curtis, phoned Xenomania while they were in a taxi in Berlin to tell them he thought "Jump" would make a good Girls Aloud single. Girls Aloud's version of "Jump" was not featured in the film itself. Love Actually uses the Pointer Sisters' original version due to international audiences being unaware of Girls Aloud, who feature in the end credits. Girls Aloud do, however, appear on the British soundtrack. The fourth single would have been the album track "Some Kind of Miracle" had the soundtrack opportunity not arisen. Girls Aloud's version retains the 1980s feel of the original, using a Roland Jupiter-6 in the chorus. The single was released on November 17, 2003 in the UK. It was available on two different CD single formats and as a cassette tape. The first disc includes "Girls Allowed", a track from Girls Aloud's debut album Sound of the Underground, and a cover of "Grease" which was recorded for ITV1's Greasemania. The second CD format featured another track from Sound of the Underground, the Betty Boo-produced "Love Bomb", and the Almighty Vocal Mix of "Jump". Meanwhile, the cassette tape (and the European CD) feature the single and the Almighty Vocal Mix of "Girls Allowed". Flip & Fill's remix of "Jump" appeared on CD1 of Girls Aloud's next single, "The Show", and the original Almighty Remix of "Jump" appeared on the "Long Hot Summer" 12" picture disc. According to Cheryl Cole in Girls Aloud's 2008 autobiography Dreams That Glitter - Our Story, the single "was the point when we realized everything we'd been doing was quite down and moody [...] and that's not what people wanted." Nicola Roberts further stated it "was meant to be. It was a turning point and everyone loved it." Critics generally gave negative reviews to "Jump". One said "the girls sound bored singing it and the listener is certainly fed up by the time the song finishes." Alexis Petridis of The Guardian exclaimed, "Xenomania throw everything they have at the track, but can't rescue a duff song." The track was slated by Lisa Verrico of The Times, who said it "takes whatever credibility [Girls Aloud] had left and runs off with it. Horrible bass, klutzy production and so-so singing put the girls at the bottom of the pop pile". RTÉ.ie said that "fans of the group will love it, but the rest of us will just wonder why, particularly since the original is so much better." On the other hand, David Hooper of BBC Music complimented the track in his review of Girls Aloud's second album: "Twenty years on, this version updates the song nicely with a welcome return of those buzzy synth sounds and gnarly bass noises from "The Show". Good work." Paul Scott of Stylus Magazine was similarly favourable, saying it "demonstrates their phenomenal power in finding a certain joy in ugliness. It’s an authentic inauthenticity set to the sound of a thousand discothèques. It’s being surrounded by a drunken hen party and finding enchantment instead of repulsion." The song debuted at number two on the UK Singles Chart, behind Westlife's cover of Barry Manilow's "Mandy". Coincidentally, both bands were managed by Louis Walsh at the time. "Jump" fell just two places the following week. The single spent four more weeks in the top twenty before falling. Overall, the song managed to spend a total of fourteen weeks in the top 75. It was certified silver by the British Phonographic Industry. On the Irish Singles Chart, "Jump" entered at number two behind "Mandy" and spent an impressive three consecutive weeks at its peak. In its fourth week on the Irish chart, "Jump" slipped just two positions to number four. It spent two more weeks in the top ten at numbers seven and nine respectively, before rising up the chart again to spend two weeks at number six. "Jump" spent a final week in the Irish top ten before falling down the chart. "Jump" is one of the few Girls Aloud songs that received an international release outside of the United Kingdom and Ireland, reaching the top ten in Belgium, the Netherlands, and Sweden. The music video for "Jump", filmed on November 13, 2003 and directed by Katie Bell, was made to appear as if it was intertwined with the film Love Actually. During the video, the members of Girls Aloud sneak into the residence of the Prime Minister, played by Hugh Grant in the film. The group sneaks into 10 Downing Street through a bedroom window before tiptoeing down a set of stairs and looking around an empty, unlit conference room. Girls Aloud eventually re-exit through the window. Various shots of the women singing and dancing, like those featured on the single's artwork, are shown throughout the video. A Grant lookalike was also hired for the music video. A version of the music video without scenes from Love Actually can be found on Girls Aloud's 2005 DVD release Girls on Film. The video also appears on 2007's Style. "Jump" was promoted through various live appearances on television shows across the UK. Girls Aloud appeared on programmes like CD:UK, GMTV, Popworld, The Rolf Harris Show, Top of the Pops, Top of the Pops Saturday (twice), UK Top 40: CBBC Viewers' Vote, and Xchange. They also performed at events such as the UK's National Music Awards and 2003's Children in Need telethon. In Europe, Girls Aloud performed "Jump" on the Netherlands' national lottery Staatsloterij (The State Lottery). During the summer of 2004, Girls Aloud performed the show at a number of festivals and open-air concerts, such as Live & Loud, O2 in the Park, Pop Beach, and CBBC's Junior Great North Run charity concert. Girls Aloud also performed it on their MTV special in October 2004, as seen on the subsequent DVD Girls on Film. In 2006, the group performed "Jump" for a television show entitled All Time Greatest Movie Songs. Since its release, "Jump" has been included on each of Girls Aloud's tours in some capacity. The track was included as the penultimate song on their 2005 tour What Will the Neighbours Say? Live. Performed amidst neon lights, the song's arrangement was closer to the Pointer Sisters' original version. For 2006's Chemistry Tour, "Jump" was included as the encore. The performance included a dance breakdown over a military drum. As the song reached its climax, pyrotechnics went off and confetti fell. There is a final explosion as Girls Aloud descend beneath the stage. It was included in the first section of 2007's The Sound of Girls Aloud: The Greatest Hits Tour. The song was included as the penultimate song again for 2008's Tangled Up Tour. The performance included an extended intro in which Girls Aloud commanded the crowd to jump. The song was slightly remixed for this tour. For 2009's Out of Control Tour, "Jump" was included in a greatest hits medley which closed the show. The single has also been performed at Girls Aloud's appearances at V Festival in 2006 and 2008. They also performed it at Twickenham Stadium in 2006 after a rugby match between the England national rugby union team and New Zealand's. These are the formats and track listings of major single releases of "Jump". *The sleeve lists the running time of 4.26 instead of the UK's 3.25, and includes the beatmasters remix of the track as found on the Greasemania album, instead of the normal track, which appears on the UK single. "Jump (For My Love)" has also been recorded by Fork (fi) (album Pink Noise Live/ 2011), Out of the Blue (as "Jump" on album Live 2011/ 2011). In 1984 "Jump..." was utilized as a television commercial jingle for Bounce dryer sheets: produced by Michael Zager, the jingle's lead vocal was by veteran session singer Cissy Houston whose daughter Whitney Houston, then in the process of recording her self-titled debut album, sang back-up. ^ "Forum – ARIA Charts: Special Occasion Charts – Top 100 Singles 1984". Australian-charts.com. Hung Medien. Retrieved December 21, 2018. ^ "Forum – ARIA Charts: Special Occasion Charts – CHART POSITIONS PRE 1989". Australian-charts.com. Hung Medien. Archived from the original on October 20, 2013. Retrieved October 12, 2016. ^ "Ultratop.be – Pointer Sisters – Jump (For My Love)" (in Dutch). Ultratop 50. Retrieved 12 October 2016. ^ "Radio 2 Top 30". Top 30 (in Dutch). Archived from the original on March 28, 2016. Retrieved October 12, 2016. ^ "Top RPM Adult Contemporary: Issue 6779." RPM. Library and Archives Canada. Retrieved 12 October 2016. ^ "Top RPM Singles: Issue 6797." RPM. Library and Archives Canada. Retrieved 12 October 2016. ^ "CHART NUMBER 1437 – Saturday, July 14, 1984". CHUM. Archived from the original on November 7, 2006. Retrieved May 10, 2017. ^ "Offiziellecharts.de – Pointer Sisters – Jump (For My Love)". GfK Entertainment Charts. Retrieved 12 October 2016. ^ "The Irish Charts – Search Results – Jump (For My Love)". Irish Singles Chart. Retrieved 12 October 2016. ^ "Dutchcharts.nl – Pointer Sisters – Jump (For My Love)" (in Dutch). Single Top 100. Retrieved 12 October 2016. ^ "Nederlandse Top 40 – week 34, 1984" (in Dutch). Dutch Top 40 Retrieved 12 October 2016. ^ "Charts.nz – Pointer Sisters – Jump (For My Love)". Top 40 Singles. Retrieved 12 October 2016. ^ "South African Rock Lists Website SA Charts 1965 – 1989 Acts P". The South African Rock Encyclopedia. Retrieved October 12, 2016. ^ "Swisscharts.com – Pointer Sisters – Jump (For My Love)". Swiss Singles Chart. Retrieved 12 October 2016. ^ "Official Singles Chart Top 100". Official Charts Company. Retrieved 12 October 2016. ^ "The Pointer Sisters Chart History (Hot 100)". Billboard. Retrieved 12 October 2016. ^ "The Pointer Sisters Chart History (Adult Contemporary)". Billboard. Retrieved 12 October 2016. ^ "The Pointer Sisters Chart History (Hot R&B/Hip-Hop Songs)". Billboard. Retrieved 12 October 2016. ^ "Billboard Jan. 21, 1984" (PDF). Billboard. New York, NY, USA. January 21, 1984. p. 45. Retrieved October 12, 2016. ^ "CASH BOX Top 100 Singles – Week ending JULY 7, 1984". Cash Box magazine. Archived from the original on October 1, 2012. Retrieved May 10, 2017. ^ "Forum – ARIA Charts: Special Occasion Charts – Top 100 End of Year AMR Charts - 1980s". Australian-charts.com. Hung Medien. Archived from the original on August 28, 2014. Retrieved October 12, 2016. ^ "Ultratop Jaaroverzichten 1984". Ultratop 50 (in Dutch). Retrieved October 12, 2016. ^ "Top RPM Singles: Issue 9638." RPM. Library and Archives Canada. Retrieved 12 October 2016. ^ "Top 100 Single-Jahrescharts 1984". GfK Entertainment Charts (in German). Retrieved October 12, 2016. ^ "Dutch Charts Jaaroverzichten Single 1984". Single Top 100 (in Dutch). Retrieved October 12, 2016. ^ "Top 100-Jaaroverzicht van 1984". Dutch Top 40 (in Dutch). Retrieved October 12, 2016. ^ "Official New Zealand Music Chart - End of Year Charts 1984". Recorded Music NZ. Retrieved October 12, 2016. ^ a b c "Volume 96 No. 51, DECEMBER 22, 1984" (PDF). Billboard. New York, NY, USA. December 22, 1984. p. TA-19,TA-21,TA-25. Retrieved October 12, 2016. ^ "The CASH BOX Year-End Charts: 1984". Cash Box magazine. Archived from the original on September 11, 2012. Retrieved May 10, 2017. ^ a b c Robinson, Peter (2009). "Jump". The Singles Boxset (Booklet). Girls Aloud. London, England: Fascination Records. p. 13. ^ "Girls Aloud – Jump (CD, Single)". Discogs. Zink Media Inc. Retrieved August 16, 2010. ^ "Girls Aloud - Jump (CD, Single)". Discogs. Zink Media Inc. Retrieved August 16, 2010. ^ John Murphy (November 29, 2004). "Girls Aloud - What Will The Neighbours Say?". MusicOMH. OMH. Retrieved October 12, 2016. ^ Alexis Petridis (November 26, 2004). "Girls Aloud, What Will The Neighbours Say?". The Guardian. Guardian Media Group. Retrieved May 7, 2006. ^ Lisa Verrico (November 28, 2003). "Cover versions tend to be grim, but this crop really stinks". The Times. London: Times Newspapers Ltd. Retrieved February 28, 2009. ^ Katie Moten (December 10, 2003). "Love Actually OST - Various Artists". RTÉ.ie. Radio Telefís Éireann. Retrieved February 28, 2009. ^ David Hooper (November 29, 2003). "Girls Aloud, What Will The Neighbours Say?". BBC Music. BBC. Retrieved February 28, 2009. ^ Scott, Paul (January 8, 2007). "Girls Aloud - The Sound of Girls Aloud - Review - Stylus Magazine". Stylus Magazine. Archived from the original on February 1, 2010. Retrieved May 21, 2017. ^ "Singer Jackson tops album chart". BBC News. BBC. November 23, 2003. Retrieved February 25, 2008. ^ "Aloud to fight it out". The Mirror. Trinity Mirror. October 31, 2003. Retrieved February 28, 2009. ^ "Young back on top of the charts". BBC News. BBC. November 30, 2003. Retrieved February 25, 2008. ^ a b "Official Singles Chart Top 100". Official Charts Company. Retrieved 12 October 2016. ^ a b "British single certifications – Girls Aloud – Jump". British Phonographic Industry. Retrieved November 18, 2015. Select singles in the Format field. Select Silver in the Certification field. Type Jump in the "Search BPI Awards" field and then press Enter. ^ "Top 50 singles, week ending 20 November 2003". Irish Singles Chart. GfK. Retrieved August 16, 2010. ^ "Top 50 singles, week ending 27 November 2003". Irish Singles Chart. GfK. Retrieved August 16, 2010. ^ "Top 50 singles, week ending 4 December 2003". Irish Singles Chart. GfK. Retrieved August 16, 2010. ^ "Top 50 singles, week ending 11 December 2003". Irish Singles Chart. GfK. Retrieved August 16, 2010. ^ "Top 50 singles, week ending 18 December 2003". Irish Singles Chart. GfK. Retrieved August 16, 2010. ^ "Top 50 singles, week ending 25 December 2003". Irish Singles Chart. GfK. Retrieved August 16, 2010. ^ "Top 50 singles, week ending 1 January 2004". Irish Singles Chart. GfK. Retrieved August 16, 2010. ^ "Top 50 singles, week ending 8 January 2004". Irish Singles Chart. GfK. Retrieved August 16, 2010. ^ "Top 50 singles, week ending 15 January 2004". Irish Singles Chart. GfK. Retrieved August 16, 2010. ^ a b "Ultratop.be – Girls Aloud – Jump" (in French). Ultratop 50. Retrieved 18 November 2015. ^ Style (DVD). Fascination Records. November 12, 2007. ^ "What Will the Neighbors Say? Live in Concert [DVD]". MSN Music. MSN. Retrieved April 24, 2010. ^ "A Girls Aloud live report". Popjustice. April 27, 2009. Retrieved August 11, 2009. ^ "Girls Aloud tear off their skirts in a tribute to Bucks Fizz at Manchester Gig". The Sun. April 25, 2009. Retrieved April 25, 2009. ^ "Australian-charts.com – Girls Aloud – Jump". ARIA Top 50 Singles. Retrieved 18 November 2015. ^ "Ultratop.be – Girls Aloud – Jump" (in Dutch). Ultratop 50. Retrieved 18 November 2015. ^ "Archívum – Slágerlisták – MAHASZ" (in Hungarian). Rádiós Top 40 játszási lista. Magyar Hanglemezkiadók Szövetsége. Retrieved 18 November 2015. ^ "Chart Track: Week 47, 2003". Irish Singles Chart. Retrieved 18 November 2015. ^ "Nederlandse Top 40 – week 52, 2003" (in Dutch). Dutch Top 40 Retrieved 18 November 2015. ^ "Dutchcharts.nl – Girls Aloud – Jump" (in Dutch). Single Top 100. Retrieved 12 October 2016. ^ "Charts.nz – Girls Aloud – Jump". Top 40 Singles. Retrieved 18 November 2015. ^ "Official Scottish Singles Sales Chart Top 100". Official Charts Company. Retrieved 18 November 2015. ^ "Swedishcharts.com – Girls Aloud – Jump". Singles Top 100. Retrieved 18 November 2015. ^ "Swisscharts.com – Girls Aloud – Jump". Swiss Singles Chart. Retrieved 18 November 2015. ^ "Ultratop Jaaroverzichten 2004". Ultratop 50 (in Dutch). Retrieved October 12, 2016. ^ "Top 100-Jaaroverzicht van 2004". Dutch Top 40 (in Dutch). Retrieved October 12, 2016. ^ "Dutch Charts Jaaroverzichten Single 2004". Single Top 100 (in Dutch). Retrieved October 12, 2016. ^ Bego, Mark (2012). Whitney Houston! : the spectacular rise & tragic fall of the woman whose voice inspired a generation. NYC: Skyhorse Publishing. p. 37. ISBN 978-1-62087-2543. "How Long (Betcha' Got a Chick on the Side)"
"Beautiful 'Cause You Love Me"
This page was last edited on 16 April 2019, at 11:48 (UTC).